We start at Keyboard Layout Editor (KLE) of course. I initially set out to design an optimal layout for programmers, which was rather ambitious. The problem is that different programming environments have different needs. People using EMACS have different needs to people using Vim, who have different needs to people using a full-blown GUI for coding. So one-size-fits-all will not work. What I ended up with, after a long process which is detailed on my blog, is the Programmers Keyboard which is currently a pre-defined template in KLE. I then developed it further and added bells and whistles, ending up with V2 which is what I thought I would build. The Alpha key layout is a slightly modified version of Workman-P, meant to be programmer-friendly. I did what I thought was clever, and put the brackets down the middle, had all sorts of possibly-useful currency, Greek and punctuation symbols, one-touch copy/paste/cut/undo/redo/select-all, provision for dozenal/duodecimal support, Pomodoro timer, dual Nav clusters (idea being that lefties could swap them around), and a cool wooden case. In that respect I was aiming for something like what keyboard.io is doing. Since Xah knows much more than me, that took me to the next phase of this voyage... looking for the best layout for English and programming. I restarted what I had been doing previously (searching for best layout, which led to Workman-P), and found various people had tackled the problem in a more scientific way. I eventually ended up at Patrick's Keyboard Layout Analyzer (KLA), where I spent many hours testing and improving layouts. Somewhere along the way I met Den and we started trading notes on layouts. This lead via Arensito and ideas from Schizo to the ErgoLinear layout form factor, shown below, which produced the best scores in KLA. We had to modify KLA to accommodate this. In fact there are now three variants of this (one from me and two from Den). After playing some more, I eventually got to a layout which got the best scores on English and programming, and which I could not beat. It follows the Arensito approach of putting the punctuation and numbers on AltGr. All the keys are the same size. The "h" is on the same key as Space, and requires AltGr to access. In spite of this, the scores are remarkable. The design is perfectly symetrical as far as the keys go. The conventional Ctrl-ZXCV layout is gone from the left, and replaced by a more compact layout on the right. In addition Ctrl-R (browser reload), Ctrl-M (menu), Ctrl-S (save), Ctrl-N (new) and Ctrl-Q (quit) are also more convenient. If you really need those on the left, then you could mirror-flip the whole design to get them back on the left. These are the scores as per Den's scoring on KLE. Den's scoring differs from the original in that vertical distance is also counted, as opposed to only horizontal. So it's more accurate. These scores are from the tests I used to compare layouts. Apart from the very technical digit and dates tests, this layout is far above others. Note: lower score is better, we are measuring Effort. Or you can compare results here: keyboard-design.com/best-layouts.html. The modifier keys use symbols rather than words. The design is borrowed from and inspired by (for the new keys) Mito's Bauhaus Icons design. I don't know the copyright status on those ideas. This is actually the 6.5 variant not the 6.4... only difference is the : and ; are swapped around. I ordered the keycaps while I was still testing, and it looked like 6.5 would beat 6.4. Turns out it didn't. The numpad layout is also unconventional, based on most frequently used digits. 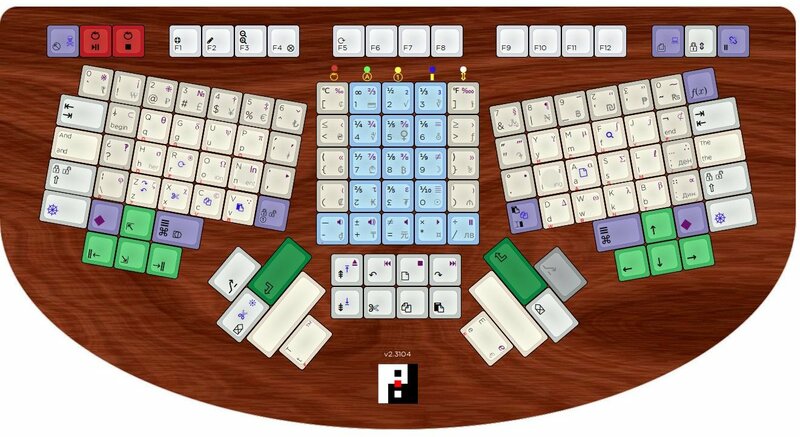 It also has other commonly-needed punctuation and Tab keys in the cluster. In truth I still want to optimize the numpad layout, so the final version might differ. If, like me, you're doing something non-standard, you'll need a way of printing the keycaps, which we'll get to in the next section. But part of the design is picking the font to be used. However SP insists that it does not exist in an electronic form, so we look for alternatives... In general, we want a sans serif font, because keys are not generally flat and/or smooth, and the printing processes have limitations, which means they can't do the fine serifs so well. So I stared at a lot of fonts. Went through the entire sans serif selection on Google Fonts, as well as whatever I had on my system, as well as programming fonts and other places with free and not free fonts to download. It does differentiate between upper-i and lower-L, but the tilde is a little flat, and it lacks some of the punctuation and Greek glyhs, which means I ended up with Hack. All the possibly-confusing characters are clearly distinguished. The ,. ;: are good sizes. 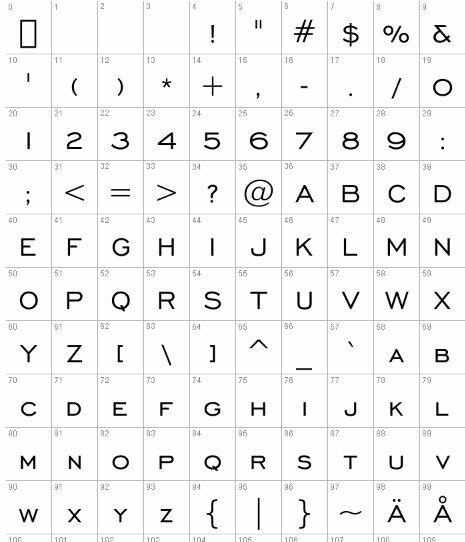 Apart from those characters, Hack has good coverage of the other glyphs I need. Yes the zero is controversial, and the typographic quotes could be prettier, but all things considered, I think it looks okay. It's not Gorton Modified but it will do. For your viewing pleasure, here are ANSI104 mockups. Click image for widescreen view.